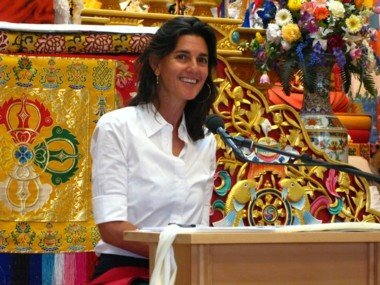 Elizabeth Mattis-Namgyel has studied and practised the Buddhadharma for over 30 years under the guidance of her teacher and husband, Dzigar Kongtrul Rinpoche. After meeting Rinpoche in Nepal in 1985, she became his first Western student. She has been intimately involved with Rinpoche’s work in bringing Buddhist wisdom to the West, in particular to the development of Mangala Shri Bhuti, an organization dedicated to the study and practice of the Longchen Nyingthig lineage. Elizabeth has an academic background in both Anthropology and Buddhist Studies, but her learning is also grounded in practice. After many years of solitary retreat, Rinpoche appointed Elizabeth as Retreat Master at Longchen Jigme Samten Ling, Mangala Shri Bhuti’s retreat center in southern Colorado. She has edited two of Rinpoche’s books, It’s Up to You and Light Comes Through and teaches the Buddhadharma in the United States and Europe. This page was last edited on 7 November 2018, at 19:18.